A few friends have asked me why I usually wear sunglass in all my pictures. One simple answer: it is because I feel like I always look tired! Juggling a 10 month old, work, and everything at home gets exhausting! I shouldn’t complain because thankfully, Zara is pretty great. But I now have a whole new appreciation for my own mom, I only hope to be as amazing to Zara! I took a couple days off from blogging to catch up on a few things and reconnect with family and friends! My house is finally clean and organized (lets see how long this will last)! I also was super excited to catch up with a few friends last week, and my family on the weekend. 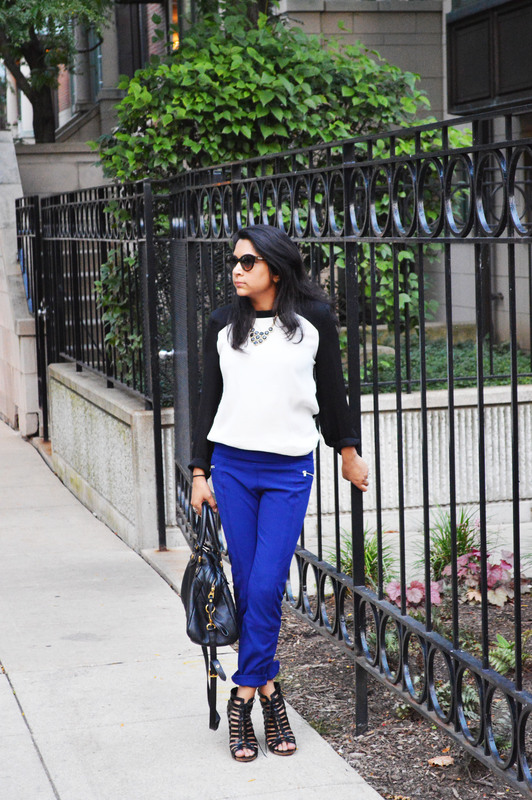 On the style: with summer soon coming to an end, I want to maximize wearing my colored pants! I paired blue pants from Zara, with a black and white blouse from Mango, I topped it off with some edgy heels.